Unfortunately, there are many companies that do not think they need any marketing. Crazy, right? Sure the whole “word-of-mouth” strategy has helped many companies blow up successfully. But, that kind of strategy is the exception, and rarely something companies should depend on. Marketing is not something to be afraid of; if your company is showcasing an awesome product or service, a little self-promotion can only help you grow. 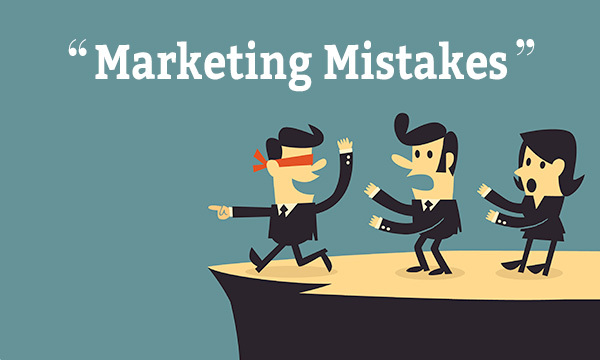 As you begin your crafting marketing strategy, avoid these mistakes so you’re appearing center stage in your industry. It’s very easy to get caught up in the design and UX of your site and continually push SEO to the back-burner. But a first page ranking on Google can lead to more web traffic and customers. Actually starting the web design process with SEO in mind is a better marketing strategy. It will help you write your web content with keywords that your customers are using to search for your product, which will boost your ranking when the site is complete. This mistake is closely tied to the first one. Blogging is an essential component of SEO. It can help your Google search ranking, drive traffic to and from your site and be great content for your social media platforms. No matter what you sell or what your service is, you CAN benefit from blogging. Unless you’ve been living under a rock, you know that in just a short amount of time, social media has exploded and changed the way we interact with the world. If your attitude about social networking continues to be: “Oh, that’s for those young kids. I’m trying to build a ‘real’ business here”, you are missing out on potential new customers and an increased amount of web traffic. It may take awhile for your profiles to become popular, but if you have the right creative team behind you, it’s worth it. It’s one thing to have your own blog to post on social media, but are you interacting with other blogs? Many organizations believe that commenting on other blogs is a waste of time and don’t think it contributes to their bottom line. I will now bring your attention to a little company called Mashable. Ever heard of it? The founder of Mashable turned blog commentary into a successful business because the insightful comments he left on other people’s blogs encouraged people to follow his blog. See what I’m getting at here? Numerous companies make the mistake of thinking that the press will come knocking on their door on their own. This is not a case of “if you build it they will come”. On your press hunting journey, you will discover that most news outlets are genuinely interested in news (imagine that?) and would love to hear your pitch. And you shouldn’t just stop at new outlets. Bloggers are always interested in interviewing too! Did we miss any? Share your thoughts on our Facebook page!